How Much Exercise Do You Need If You're Over Age 65? The right mix of exercise activities when you are over age 65 can help you stay fit and reduce your health risks. It can be confusing as to how much exercise you need, so the American College of Sports Medicine (ACSM) and the American Heart Association (AHA) have guidelines for adults over age 65, and for those age 50 to 64 with a chronic condition, such as arthritis. The basic prescription is for endurance exercise, strength training, and flexibility exercises. You may also benefit from balance exercises if you are at risk for falls. See how much exercise you need. Raise your heart rate for at least 10 minutes at a time. The guidelines show how you can do it with either moderately-intense or vigorously-intense physical activities. You can also mix it up, with some days of moderate aerobic exercise and others of vigorous aerobic exercise. Choose the activities you enjoy—dancing, brisk walking, cycling, or swimming. It's also fun to enjoy different activities throughout the week. How Long: The minimum time for moderately intense aerobic exercise is 30 minutes per day, but you will get even more benefits if you can exercise for 60 minutes per day. You can break up exercise into shorter workouts of at least 10 minutes at a time. The total should be at least 150 minutes per week. How Often: You should exercise at least five days a week. What Does Moderate Aerobic Exercise Feel Like? You are at a moderate intensity when your breathing and heart rate are noticeably increased. You can still carry on a full conversation, but you will be breathing heavier and may be sweating. On a 10-point scale, with zero being a state of rest, moderate would be a 5 or 6. Kinds of Exercise: Brisk walking, easy jogging, treadmilling, elliptical trainer, bike riding, swimming, dancing are moderate-intensity aerobic activities. 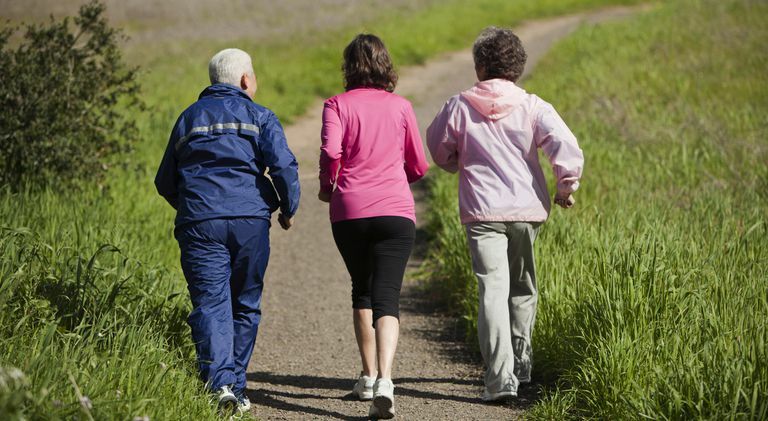 For older adults, walking is the most accessible exercise. If you have any orthopedic problems, such as arthritis in your knees and hips, you may want to use aquatic exercise or a stationary cycle to reduce the stress on your joints. What Doesn't Count: You are not in the moderate-intensity zone with an easy walk where you may be adding steps on your pedometer but not breathing heavier. You need to increase your walking speed, walk uphill, or go up stairs to boost your heart rate into the moderate zone. How to Start Walking: If you haven't been walking for exercise, you can get started by walking for 10 to 15 minutes at a time. Work on good posture and steadily increase your walking time by 5 minutes for each session each week. You should be able to build up your walking time in four weeks to be able to enjoy 30 minutes at a time. Once you are able to walk comfortably for 30 minutes, you can begin to work on improving your walking speed. If you are already walking for fitness, you can use a weekly walking workout schedule that varies the intensity of your walking workouts. How Long: If you exercise at vigorous intensity, your workouts need only be 20 minutes long at a minimum. At this higher intensity, you should aim for a minimum of 75 minutes per week, and 150 minutes may give more benefits. How Often: You meet the guidelines with three days a week of vigorous aerobic activity. What Does Vigorous Aerobic Exercise Feel Like? At a vigorous intensity, you are breathing rapidly and no longer able to easily carry on a full conversation, just short phrases. Your heart rate is boosted and you will probably break a sweat. On a scale from 1 to 10, vigorous exercise would be a 7 or 8. Kinds of Vigorous Aerobic Exercise: With different levels of fitness in older people, some will achieve vigorous exertion with brisk walking. Others will need to jog or bike to increase their exertion to the vigorous level. Strength training exercise is especially important for older adults to prevent loss of muscle mass and bone density, as well as to be able to move and function better. You should work out all of your major muscle groups. This is also called resistance exercise. How Many: Do eight to 10 strength-training exercises, eight to 12 repetitions of each. How Often: Do your strength workouts two to three days each week. What Are Strength Training Exercises? Lifting, pushing and pulling exercises will build muscle strength and endurance. You can use exercise machines at the gym, resistance bands, or free weights such as dumbbells, barbells, medicine balls. and kettlebells. Exercises such as calisthenics use your own body weight to provide resistance. In addition, if you are a gardener, you can count digging, lifting, and carrying as strength exercises. Getting Started: You can visit a fitness center or use a strength training guide to learn the fundamentals. It can be beneficial to get the advice of a trainer on how to modify exercises so they are appropriate for your fitness level and any orthopedic problems you have. Spend 10 minutes two days per week minimum to stretch your major muscle and tendon groups. Take 10 to 30 seconds per stretch, and repeat each stretch three to four times. Flexibility will help you in your daily activities. Engaging in any exercise can help reduce your risk of falls. Adding balance exercise three times a week can further reduce fall risks. The U.S. Department of Health and Human Services guidelines recommend balance training with exercises such as backward walking, sideways walking, heel walking, toe walking, and standing from a sitting position. You can add these balance moves to your daily walk to enjoy both activities. Tai chi and yoga may also help develop balance. If you have limitations that don't allow you to meet the guidelines, the most important thing is to be active in some way each day. Any amount of exercise is better than none, so getting started is the key. You need to avoid inactivity. How Do the Guidelines Compare With Others? Older adults need just as much exercise as those under age 65, plus the addition of flexibility and balance exercise. While you may decide to enjoy moderate-intensity rather vigorous-intensity exercise, you still need endurance activity. The ACSM/AHA guidelines vary from the U.S. Department of Health and Human Services 2011 guidelines in only a minor way. The HHS guidelines call for 150 minutes of moderate physical activity in a week and say to spread it out throughout the week. That is the same amount of exercise, but with more leeway in how it is apportioned throughout the week. The ACSM and AHA organizations say they endorse the HHS guidelines. Healthy older adults can get started on their own but may want to work with a health care provider or trainer to devise a workout plan that is safe and appropriate. If you have a chronic condition, work with your doctor or another health professional to develop an activity plan that takes into account any of your health conditions, risks, and therapeutic needs. You will get the most out of the exercise you can safely do. You don't have to stop with just performing the minimum exercise schedule listed. More frequent and longer workouts can further reduce health risks and help prevent weight gain. But don't despair if you can't meet the minimum requirements. Simply getting up and doing activities rather than sitting will help reduce your health risks and allow you in your daily life. Chodzko-Zajko WJ, Proctor DN, Singh MAF, et al. Exercise and Physical Activity for Older Adults. Medicine & Science in Sports & Exercise. 2009;41(7):1510-1530. doi:10.1249/mss.0b013e3181a0c95c. Physical Activity Guidelines for Americans, Chapter 5: Active Older Adults. HHS Office of Disease Prevention and Health Promotion. https://health.gov/paguidelines/guidelines/chapter5.aspx.